ABSTRACT: In part one of our analysis of the autonomous vehicle landscape, we examine the progress towards full autonomy and the disruptive impact to the automotive industry and mobility more broadly. We assess the innovation timeline, barriers to commercial scale, and develop potential adoption scenarios that may emerge. Autonomous vehicles and the transformation of mobility unlock novel business models and address evolving consumer needs. Success in “new mobility” will require adaptability in an evolving ecosystem and an ability to best monetize on consumers’ desires. The acceleration of innovation and investment surrounding the development of the autonomous vehicle (AV) is poised to disrupt the automotive industry and more expansively, mobility at large. Both incumbents and new entrants are betting on an aggressive timeline for the deployment of AV capabilities, but bringing AV to commercial scale presents several issues that require resolution. Driven by the speed of technological development, consumer perception of AV abilities, and resolution of regulatory issues, adoption scenarios with varied timelines and magnitude of impact may arise, resulting in disruptive ramifications across mobility. Early building blocks for full AV capabilities are offered by OEMs today in the form of advanced driver assistance system (ADAS) packages, which monitor specific driving functions and warn or assist the driver if necessary (e.g., blind spot monitoring, forward collision warning). While the system of sensors, processors, and actuators enabling these systems form the foundation of AV technology, significant improvement in speed, accuracy, and decision making power is necessary before the system can assume full control from the driver (See Exhibit 1). 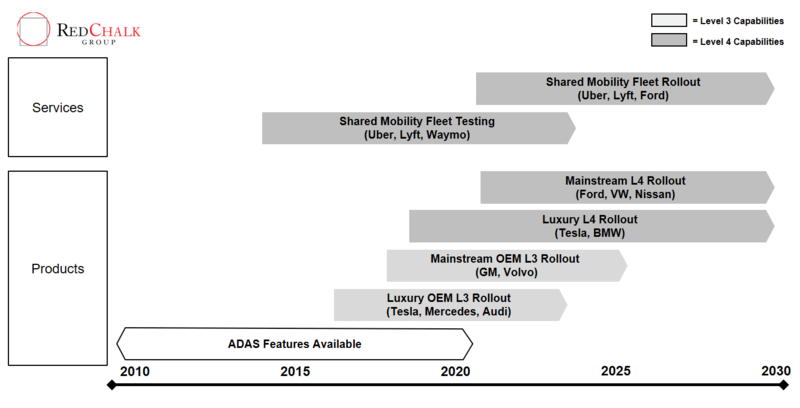 Current ADAS systems have followed an evolutionary process, with incremental additions to capabilities in each new installment. 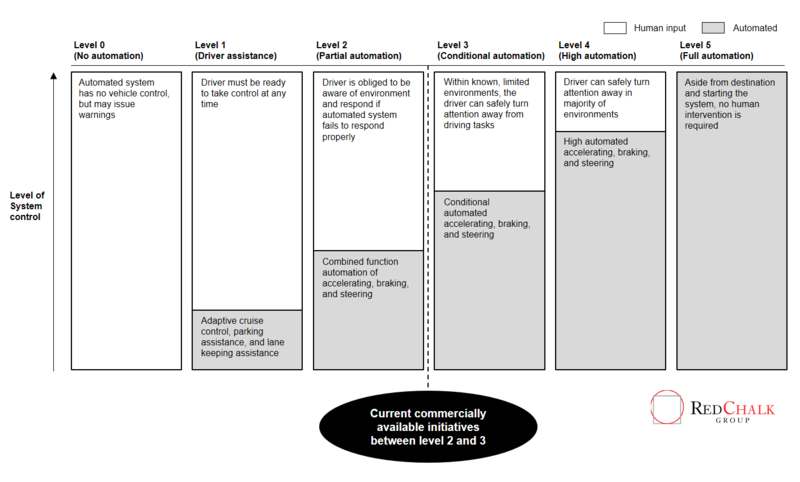 Most ADAS systems possess L2 combined function automation (e.g., acceleration/deceleration and steering), while the most advanced systems (Mercedes-Benz Intelligent Drive, Tesla Autopilot) are monitoring an increasing share of the driving environment and moving to level 3 distinction. Other AV players (Waymo, Ford) have employed an alternative strategy, focusing on development of full level 4 capabilities so that the system does not rely on the driver for fallback assistance. Regardless of development strategy, the major AV players are anticipating commercial deployment of level 4 capabilities in the next 5 years (See exhibit 2). Future AV deployments are expected to follow the trends of vehicle technology, led by luxury brands and closely followed by mainstream OEM brands. Deployments of advancing AV systems will be focused on two go-to-market strategies: add-on technology packages with new vehicle sales, and shared mobility fleets (robo-taxis) following the Uber model. Regardless of go-to-market strategy, this deployment timeline faces obstacles that can delay and impede widespread adoption. The regulatory environment governing AV technology is a significant obstacle that incumbents and new entrants face. Current driving regulations are predicated on the assumption that humans are controlling the vehicle, and AV systems fundamentally alter that dynamic. There are no standards that govern minimum safety and security requirements for safe operations on the road, and the opaqueness of these AV systems make determining liability difficult in the event of an accident. These problems have no clear solution and cooperation between regulators and AV developers is vital to successful deployment of AV systems. Without structures in place to scrutinize levels of safety of AV systems and facilitate clear assessment of liability concerns, the disruptive impact and timeline of AV technology will be delayed or diminished. Artificial intelligence (AI) technology is the brain that enables AV capabilities, attracting R&D efforts from many tech companies, from startups to tech giants, as well as automotive OEMs and suppliers. These systems analyze the incoming data on the driving environment and use deep learning to recognize threats and learn to react accordingly. The challenge is that human drivers have highly unpredictable and often irrational judgment while driving, and learning to navigate in this chaotic environment requires extensive testing and simulation. Processing power must also improve so that the system can handle the vast amount of data collected and still act in a timely fashion. These components must be integrated into a seamless operating system and continuous testing will determine when the technology is ready for commercial release. The level of investment in AI research and progress from leading players like Nvidia have created an optimistic backdrop for AV developers regarding release timelines, but ultimately, consumers must be convinced to facilitate adoption. Consumers must trust the system for AV capabilities to be adopted at scale, and unsurprisingly, current perception of AVs is currently mixed on this issue. According to industry surveys, a majority (61%) of U.S. drivers want partial AV technology in their next vehicle, but 78% of drivers are afraid of riding in a self-driving vehicle. While consumers appreciate assistance from ADAS systems, they are wary to cede complete control to the system, and incidents such as Uber vehicles running red lights and Tesla Autopilot crashes contribute to this wariness. Increased exposure to AV technology and experience of its benefits are necessary to increase consumer trust, as studies have found that drivers who own vehicles with ADAS systems are 75% more likely to trust the technology than those without it. 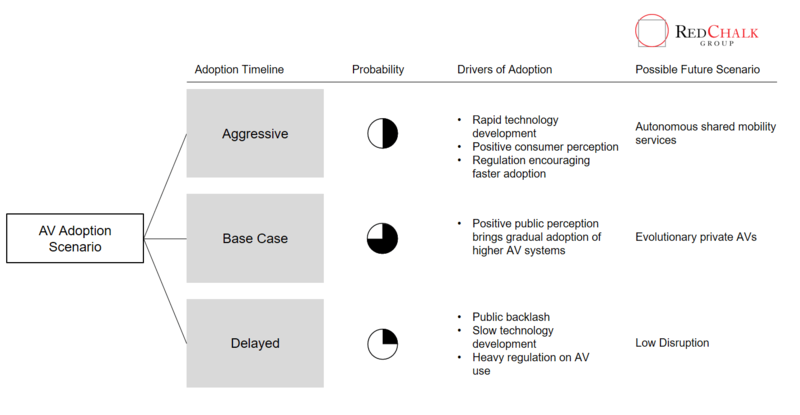 Consumer perception will drive adoption of AV in the future, and adoption scenarios will evolve based on this dynamic (See Exhibit 3). Driven by the resolution of the issues described above, three adoption scenarios may emerge. Slow technology innovation or negative consumer perception resulting from accidents involving AVs would cause a delayed adoption timeline and could stop AV technology from causing significant disruption. The low disruption would keep OEMs dominant in the automotive industry, with ride-sharing and taxis performing only peripheral services. Alternatively, the base case scenario depicts gradual acceptance and a moderate adoption timeline. The evolutionary addition to ADAS systems will help build consumer trust in autonomous capabilities and make consumers more willing to adopt additional AV features. Alongside privately owned AV systems, rollout of ride-sharing “robo-taxis” fleets will emerge as it provides the convenience and safety of AV without the upfront premium price. Since ride-sharing leaders operate with a low asset business model, partnership opportunities are available for OEMs (GM-Lyft, Uber-Daimler) and others (fleet management, taxi operators) to capitalize on this emerging market. While the private ownership and shared mobility models are complementary in this base case, the high adoption scenario has potential for more substantial shifts in mobility. A combination of rapid technology innovation and positive consumer perception can propel AV technology to a more aggressive adoption timeline. Initial adoption would follow the base case with private AVs and ride-sharing, but aggressive adoption would promote interest in shared mobility models, particularly in high density cities, due to the low vehicle ownership rates and increased utilization of vehicles. An increase in fleet usage presents opportunity for players like rental car companies and fleet management operators to offer expertise in fleet optimization, as well as media and entertainment suppliers to provide personalized comforts in shared fleets. A shift from the ubiquitous privately owned vehicle to shared mobility models offer opportunity for innovative business models and niche players a chance to modify strategies to benefit from the future of mobility. 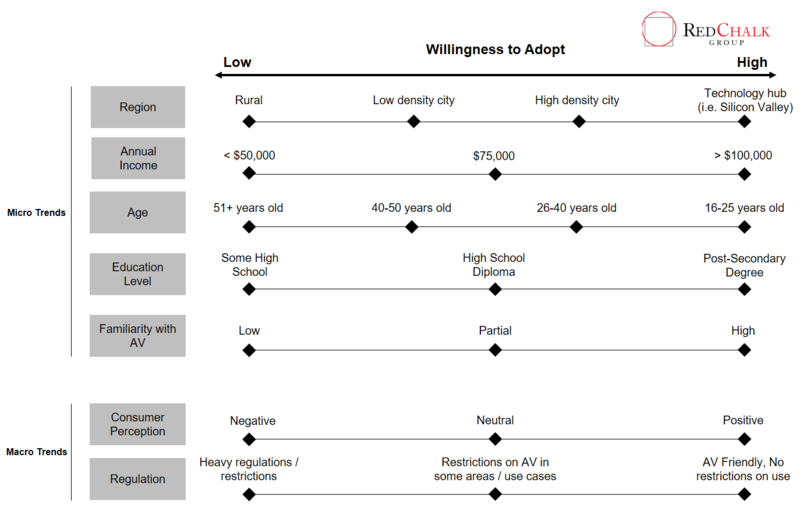 While this aggressive adoption scenario is possible, the heterogeneous nature of customers and their environments mean AV technology will experience uneven adoption, emphasizing the need for a localized lens to target customers and markets with high willingness to adopt using a segmentation approach (See Exhibit 4). The decision to adopt AV technology is a complex choice and consumers consider a myriad of factors. Creating customer profiles of people with high willingness to adopt is important to targeting markets with high likelihood of initial adoption. For example, surveys suggest younger generations are more willing to accept AV technology, so recognizing the customers willing to adopt and the model with most value to them is essential to drive early success. In a city like New York with high population density and low vehicle ownership rates, a ride-sharing fleet model offers a more compelling value proposition, whereas a sprawled suburban city in Texas may see higher private AV adoption. Consumer preferences allow for varying degrees of adoption for each level of autonomy, and recognizing appropriate revenue models for AV levels is an opportunity for various players. IoT Connection – As the Internet of Things (IoT) proliferates and devices can be connected more seamlessly, opportunities arise in the automotive space. Partnerships between automakers (Ford, Mercedes-Benz) and smart home players (Nest, Amazon) illustrate the interest in connecting more devices to facilitate ease of use. How does advancing AV technology transform the revenue opportunities in the IoT space? Integrated Entertainment – The productivity gains of successful deployment of AV technology will result in a paradigm shift for the automotive industry, merging AV with developing infotainment systems (Spotify-Tesla, various Pandora partnerships) to provide an integrated mobility and entertainment machine. As AV capabilities progress, how can automotive companies provide added value with entertainment systems integrated into the UI/UX of the vehicle? Robust entertainment systems can become an important differentiator as AV adoption proliferates. Infrastructure – Communication between AV vehicles and surrounding environment (vehicles, infrastructure) is essential to enabling safe use. In an ecosystem of connected cars, data on traffic flow can be analyzed to optimize road usage (dynamic toll pricing models, surcharge on zero-occupancy driving), as well as cater to individual driver habits (personalized advertising).